The Giroptic 360cam is a 360-degree camera built to easily capture video and photos from every angle. Compared with other 360-degree cameras, it’s shape is very unique and crashproof. Below are the complete specs, pros and cons, reviews and suggestions about Giroptic 360cam, hope these can give you a reference if you want to buy a 360-degree camera. Giroptic 360cam is the first consumer-ready camera that was born out of a Kickstarter campaign two years ago that brought in $ 1.4 million of crowdfunding. With access to this affordable full HD camera one no longer needs expensive camera rigs and post-processing software to create 360 degree images or videos with Virtual Reality (VR) experience. Armed with three equidistant optical lenses and three microphones, it records full spherical videos and high quality JPEG images that can be shared via your smartphone or computers without any extra software. 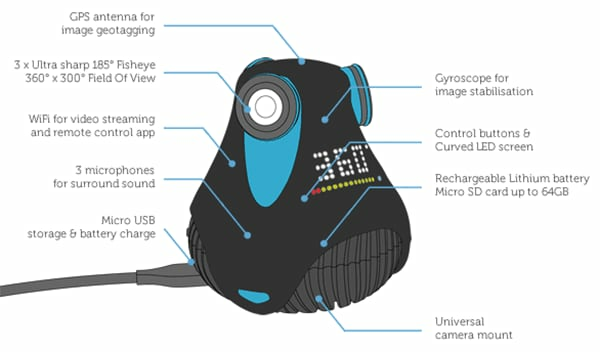 The funky pear or egg shaped design of Giroptic 360cam not only makes it totally compact and compatible to all kinds of environments and uses but also quite unique in the market. While the top houses the lenses, the bottom third of the body is detachable and holds that battery and the micro-SD card. The tripod mount and the Ethernet port are also located at the bottom of the camera. The black rubber coating makes it extremely suitable for rugged use and also water-resistant; it can survive up to 30 feet deep underwater for 30 minutes. Operating Giroptic is very easy as it is essentially one-button process. You only need to press once to record, once to stop; leave the stitching and processing of the frames to your camera. The stitched videos/images will be automatically ready to be uploaded to social sites. Apart from the button to start/stop recording, there’s another small button in the camera that lets you switch between different shooting modes like Video, Photo, Burst and Timelapse. It uses a small LED display to show you the current shooting mode and the power level of the camera. An inbuilt adaptor allows you to look at photos as soon as you take them and decide whether to delete the unwanted photos. Giroptic 360cam is capable of functioning as a good surveillance camera in your home or workspace. This smart camera can be the diligent record-keeper of all your important business meetings, travels, memorable gathering of family and friends or any sports event. The camera can capture 4K photos at up to three shots per second and record 2K videos at 30 frames per second. However, its maker Ollier admits that Giroptic 360cam can’t compete with high-end professional 360 cams of Nikon or GoPro. The 2K videos created by the camera have slightly visible stitching lines. However, the sophisticated digital stabilization technology used in the camera ensures that the processed footages run smooth and look good. For amateur shooting purposes, it is no doubt the best! You don’t need any extra software or external accessory to process the captured images and videos and stitch them into single 360-degree spherical shot. Your Giroptic cam will do that automatically and make the stitched video file ready for social media sites like YouTube, Facebook and Instagram right in the camera itself. It is a smart gadget that knows which sites accept what file formats. With the help of the Giroptic's mobile app lets you can easily adjust a few settings, activate camera stabilization during a live feed. The stitched photos and videos can be easily transferred to any device including smartphones, tablets, PCs and virtual reality headsets. Giroptic 360cam provides you with a number of definite advantages over its competitors in the market. 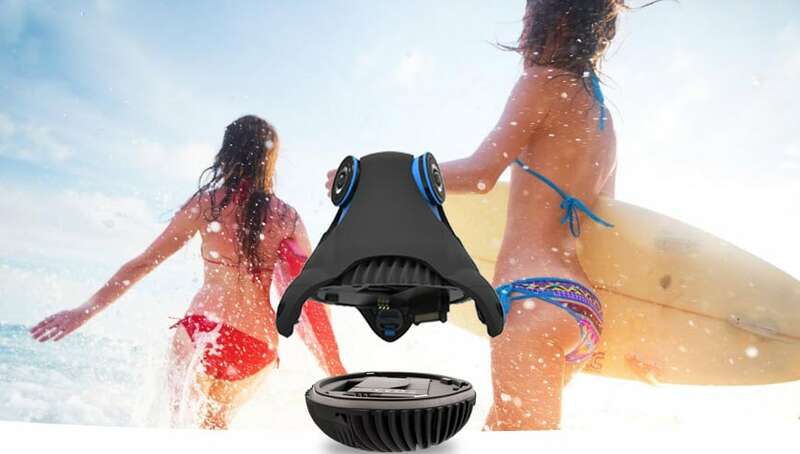 Though the video quality is not as good as Kodak’s or 360fly’s, Giroptic 360cam is certainly a good HD cam which records true 360-degree images. It is also more compatible and works with more smartphone models than cameras like Samsung Gear 360. With its shock and water resistant features and the tough rubber coating on the body, it is certainly more durable than many other cameras in the market. Although Giroptic is costlier than LG’s 360-degree camera, the video captured by the former is much better in quality. Finally, Giroptic 360cam is more versatile and resistant to elements than most of its near competitors. It is no doubt an all-purpose 360-degree cam that will provide you with a faithful 360-degree experience. Ordered a Giroptic 360 cam and it is awful. They offered to send us a replacement cam about 2 months ago and now they are only answered their emails once a day and stalling on delivery. They keep changing their minds. Does anyone know their support number? Emailing is just useless now.